I’m sorry, Ruger. It won’t happen again. It was not by choice. 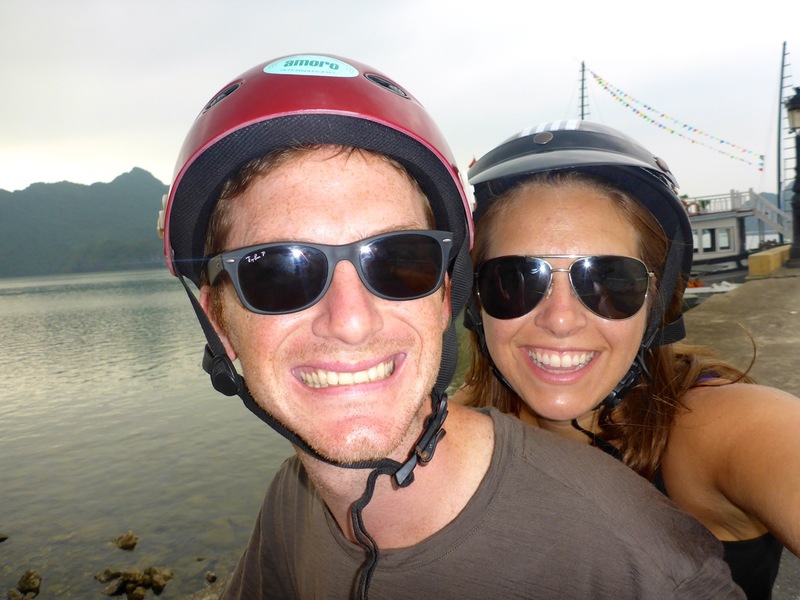 We had been riding our motorbike all around Cat Ba Island all morning and into the afternoon and we skipped breakfast. So we were HUNGRY. 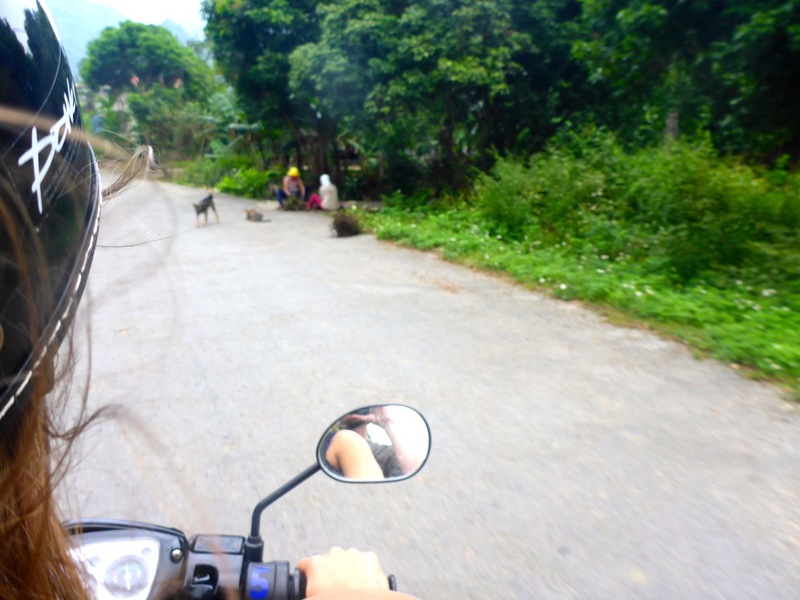 We were on the far side of the Cat Ba Island, away from town, and wanted to take the long beach road back, so if we wanted to eat it was going to be at one of these houses we were passing that magically turns into a restaurants if you slow down and look at them. It’s really just a house… but if they think you might buy a meal, you’re suddenly being flagged down and called in (in Vietnamese of course!). 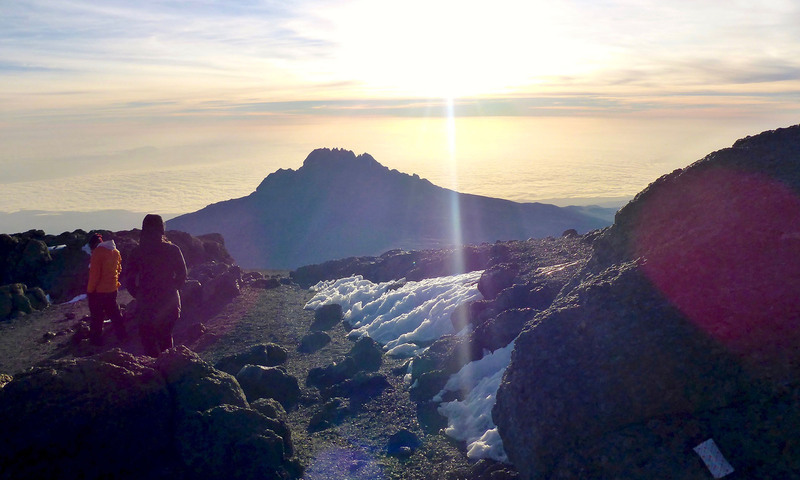 ok, last try…. “Pho?” …big smile and a big nod! We feel like it’s a victory. We signal that we want 1 Pho, and then we are able to point to a beer can and get 2 beers. She hurriedly goes off to prepare our Pho. 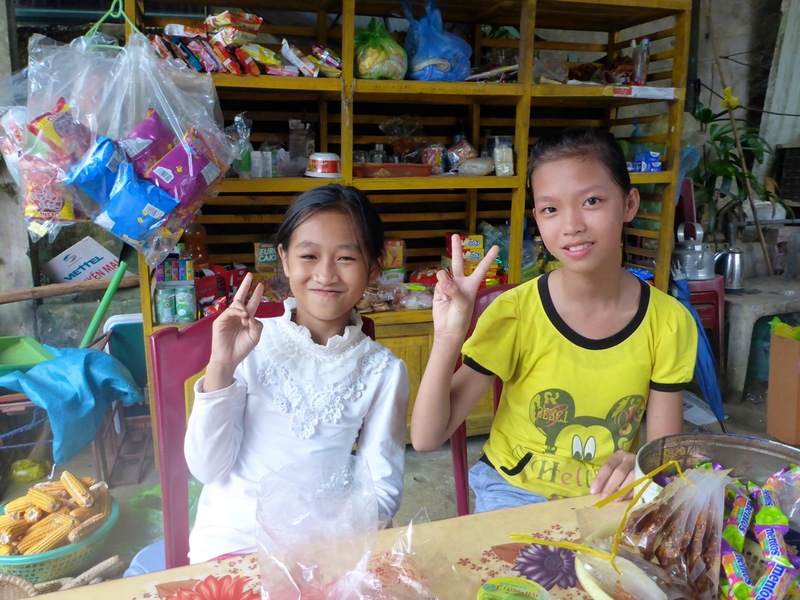 In the mean time two very sweet Vietnamese girls, about ten to twelve years old come over and start trying to practice their English with us – really it’s limited to Hi, How are you, What your name, My name _____. 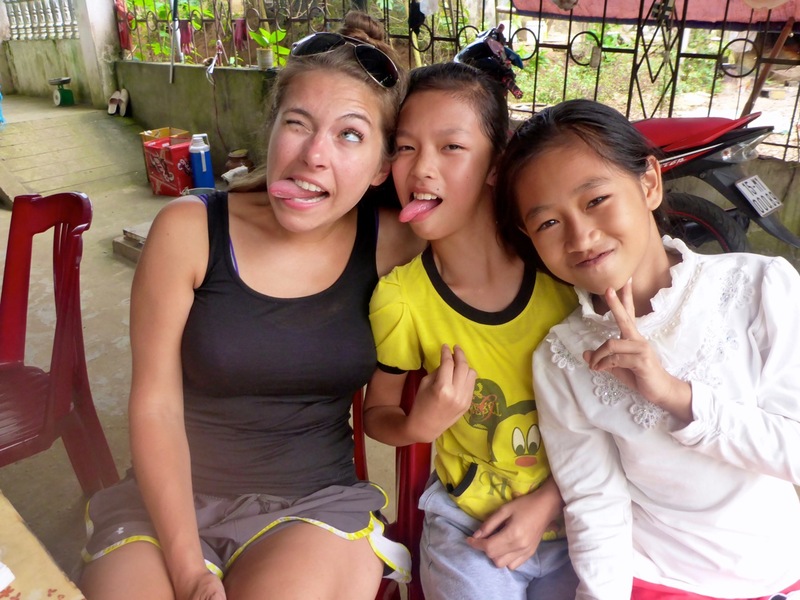 But we have fun trying to talk with them and playing our now standard game of charades. But then almost in unison, we notice there a couple of mama dogs with cow-sized udders, running around the house and street but strangely only one puppy. 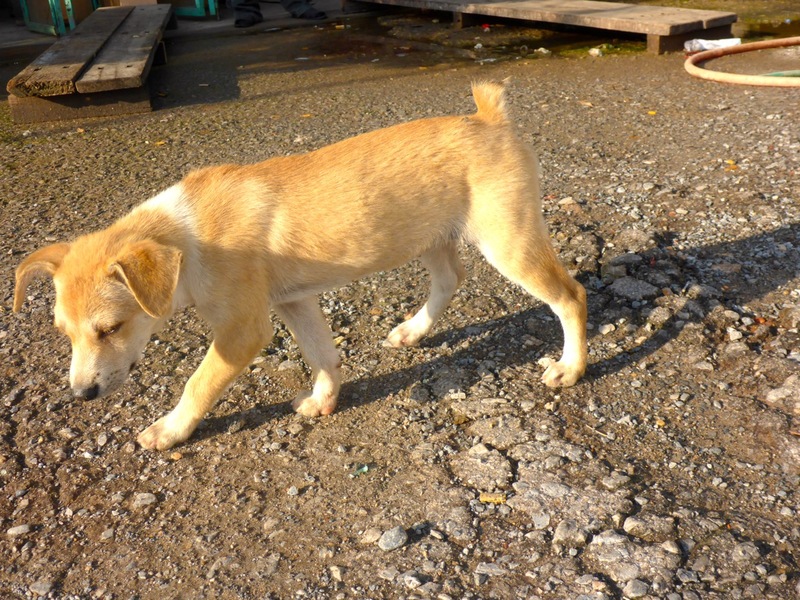 We had learned from our guide the day before that while people ate dog meat, they didn’t eat the dogs they considered pets. They will basically keep a mama dog or two and a male dog, and don’t ever plan on eating those… but they do get those “pets” to make puppies, and the puppies are enjoyed…on a plate. But surely no… not our pho. The two girls are still sitting with us, taking pictures with us and trying to talk. So we decide, we’ll just ask them what’s in our soup. 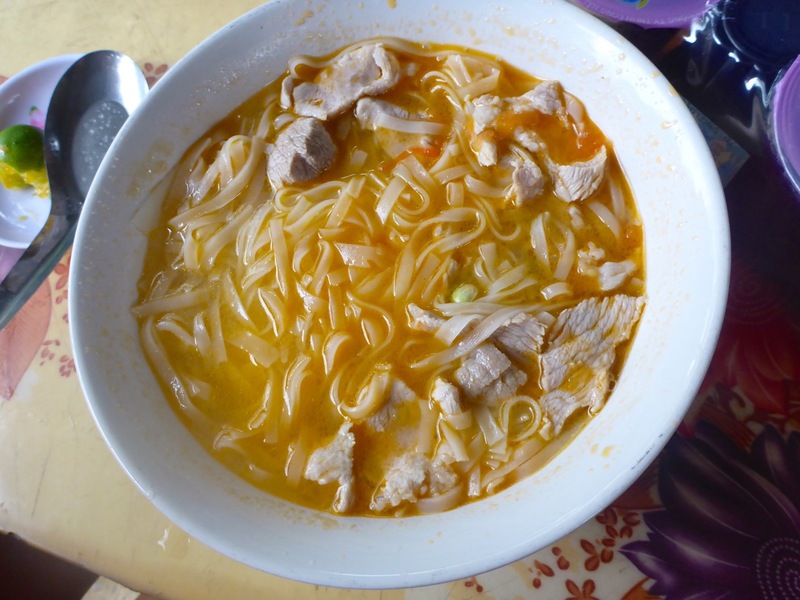 We point to the soup, hold up a piece of meat, and make the questioning face and shrug our shoulders…. Then we start the animal imitations. We moo – they laugh and shake their heads. We point to a chicken across the street and cluck, cluck, cluck – they shake their heads no. We oink – they laugh at us and shake their heads. I do my best goat baa, Rick has to follow up with a head-butting action to get the point across – they shake their heads again. We quack – more head shaking. We look puzzled… so the girls try to act it out for us. I’m still not 100% on what they were going for, or maybe I just don’t want to be, but it involved bending down and makes a handsign like you were motioning for something to come to you, and they made a sound like “puh, puh, puh” or “ruh, ruh, ruh”, and motioned in the direction of a near by dog. I suppose we’ll never know for sure, and I’d like to think otherwise, but all signs seem to unavoidably point to dog. For what it’s worth, Rick says he thought it tasted pretty good. I can’t quite get there. And after that, it seemed like everywhere I looked I saw signs for dog restaurants. 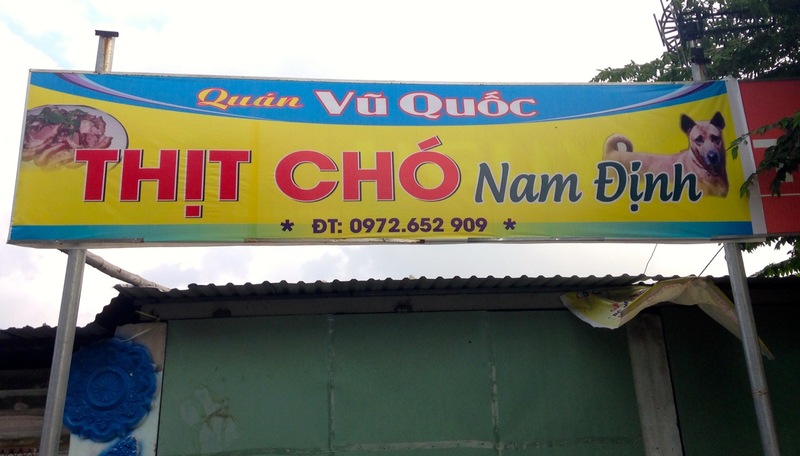 I know it’s not in English, and I don’t know Vietnamese, but I can promise you this is not Mutt’s Cantina, not a sign for a dog-friendly restaurant. Do not bring your pooch to the patio here. It’s definitely on my list of meals to be avoided in the future. 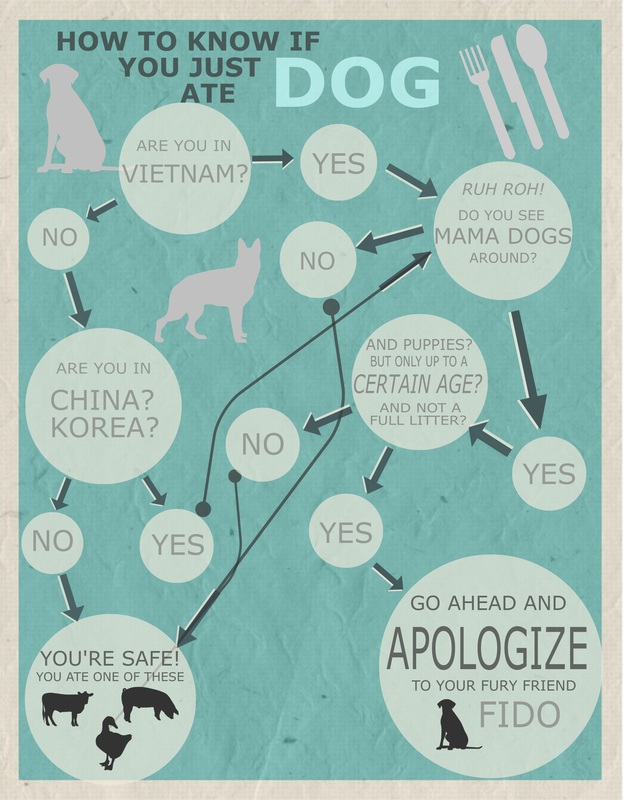 And as a public service, I’ve created this handy chart to help you know if you are eating dog in Vietnam. This is sad and hilarious at the same time! So man’s best friend becomes man’s best pho! Yep. It was definitely an “experience” I don’t think we will be intentionally repeating… kinda makes you think though. Cambell’s Soup called, they want the recipe.